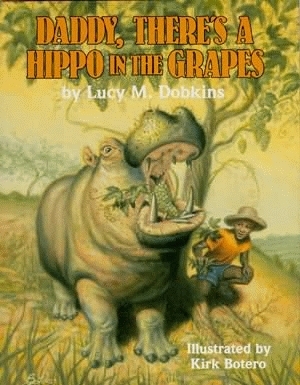 Daddy, There’s a Hippo in the Grapes is an excellent introduction for children to the cultural heritage of people and life in equatorial Africa. The story follows the successes and failures of a Kenyan boy named Ibrahim Ngobe, providing young readers with a personal perspective on his family, their farm, their society, and their relationship with the environment and nature. Set in the hills of Kenya, Daddy, There’s a Hippo in the Grapes tells the story of young Ibrahim and his rather special problem—his father’s harvest of grapes has suddenly become a delicacy to the local hippos. Ibrahim has difficulty convincing his family that hippos were invading their vineyard, and once they finally believe him, he must face the task of ridding the vineyards of the hippos and the other animals who have come to dine there. An educator, children’s storybook author, and textbook author, Lucy Dobkins brings to life the intriguing setting of Kenya through her wonderful descriptions of the farmlands, plains, and jungles of the region. Her experience with children has made her an ideal resource for a story that will not only hold a child's attention, but will teach the values of an alternative culture. With the help of illustrator Kirk Botero, her descriptive text creates give a clear image of contemporary Kenya for young readers.